← Show us the Evidence! When Nicky Morgan took over from Michael Gove there was a sigh of relief from schools across England when she said she was not a forcing type of person. But her first education bill could force hundreds of headteachers on to the scrap heap and their schools into multi academy chains. What are the so-called roadblocks that the DfE cites? Will parents and staff have a right to be consulted about academy status? Do communities have a right to protest against decisions made in Whitehall about their local schools? People have a democratic right to question decision-makers over how public money is spent, especially when their national assets are being gifted on 125 year leases to friends of the Tory government. 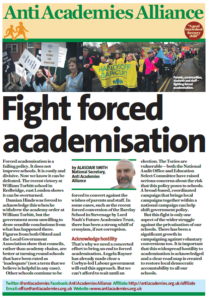 Parents object to academies because they know there’s a lack of local accountability and that academies don’t have to employ qualified teachers. Inspiration Trust has advertised for unqualified teachers at a salary of just £16,300 and STEM6 in Islington tried to move its teachers on to zero-hours contracts. And parents don’t like the fact that there’s no turning back – a failing academy cannot be transferred back to its local authority. Parents, teachers and headteachers know that academisation is not a magic bullet for school improvement. The techniques cited by the executive headteachers and academy principals to raise standards are available to every school. Nicky Morgan says that academy status will prevent children languishing in under-performing schools but 46% of sponsored academies are themselves judged by Ofsted as ‘requires improvement’ or ‘inadequate’, including a number in the MAT chains quoted in the DfE’s press release. There is no rationale behind the conversion of these schools. Parliament’s own education select committee said it found no evidence, after a decade of the academies movement, that academy status had improved performance. We can only conclude that Morgan’s latest drive to extend academy status is intended to further disempower teachers, governors and local communities while allowing trustees to line their own corporate pockets. Downhills Primary was not failing its pupils. Parents and governors defended the school because it was inclusive, happy and improving. SATS results had rocketed from 37% to 64% and, in October 2011, Ofsted said the school had a ‘clear trend of improvement’ and ‘experienced senior staff with high levels of expertise’. The school governors believed that academisation would be a distraction from the school’s development and they issued a legal challenge to the then Secretary of State. So just a few weeks later, in January 2012, Michael Gove sent the same inspector back to the school who judged it as a total failure. The governors and parents recognised that academy status does not of itself lead to school improvement – just this week, for example, a primary academy in Cambridgeshire has gone into special measures. 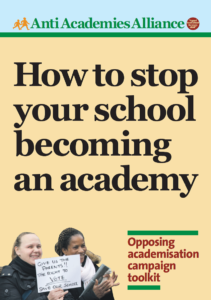 Parents recognised the academies and free schools programme is a smokescreen to hand control of public assets to corporate interests and to the government’s wealthy cronies. 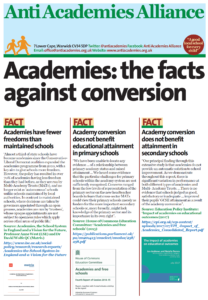 This entry was posted in News, Top story and tagged Education Bill, Forced academisation, Nicky Morgan, Parents. Bookmark the permalink.